Bone Suckin’ Poultry Seasoning & Rub, 1 Tbsp. 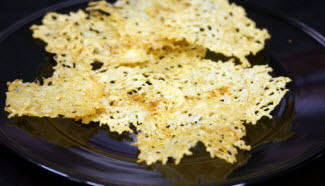 Pour two tablespoons of shredded Parmesan cheese on a parchment paper or silicon baking sheet and lightly pat it down. Space the crisps about ½ inch apart. Sprinkle a pinch of Bone Suckin’ Poultry Seasoning & Rub as soon as the crisps come out of the oven. Let cool for 5 minutes and serve with soup or salads. Great as appetizers too! Recipe makes 10 crisps.